Since the middle of 2009 certain ECUs made by Bosch have been trumpeted as ‘anti-tune’ in that they supposedly can’t be remapped as they are ‘locked’ or feature ‘anti tuning protection’. This simply isn’t the case as there’s no such thing as ‘anti-tune’ or ‘locked’ software. We suspect it’s more likely that some less experienced or less well equipped tuning companies and individuals don’t fully understand these ECUs, so perpetrate the myth that they can’t be remapped. We’ve developed a safe and reliable method to remap these Bosch ECUs involving the removal of the ECU from the vehicle and connecting to it directly. This is an important procedure as trying to reprogram the newer ECU with its ‘anti-tune’ software in situ would likely result in the ECU being damaged beyond repair. 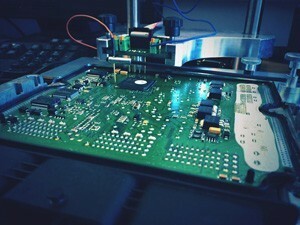 We take a careful look at these ECUs when assessing a vehicle for remapping. Even if made before 2009, it’s possible for older generations of the ECU to be programmed at the main dealer with the newer ‘anti-tune’ software. As described above, they’d sustain irreparable damage if a remapping was attempted in situ. So rest assured if your vehicle has one of these ECUs fitted - or the ‘anti-tune’ software has been loaded onto older versions - we’re experienced, responsible and knowledgeable enough not to damage your ECU and follow the correct remapping procedure as described above. We’re so confident you’ll be delighted, we offer a full 7 day money back satisfaction guarantee and a lifetime guarantee on all remapping software installed.